Born a sharecroppers son in 1930, Carl Knight fell in love with music at an early age while attending St. Joseph Academy, in his home town of Jackson, Mississippi. In 1949, upon graduation, he started singing and performing around his area in clubs, mixing the songs he was writing with the hits of the day and making his living playing music. Now 81 years old, Carl has heard songs he wrote sang by great artists such as Loretta Lynn, Charlie Pride, Jerry Lee Lewis, Mel Tillis and Cal Smith, to name a few of his 48 cuts. Encouraged to move to Nashville by none other than Mr. Chet Atkins, he's still actively writing, performing, and pitching his songs to the stars on Music Row. Recent accomplishments include receiving a 2010 Lifetime Achievement Award from the Nashville Songwriters Festival, induction into the Mississippi Hall of Fame, and a soon to be released documentary on Carl on the Discovery Channel Network. The following is taken from a 30 minute interview at his beautiful home in Hendersonville, meet Carl Knight. Bronson: Do you remember the first song you ever wrote? Carl Knight: I started really seriously trying to write when I was 17 or 18 years old. The first thing that I ever wrote, and I thought it was a monster, it was called, "The Game Of Love", (laughing). It was a good title but I never did anything with it. Bronson: How old were you when you started singing your songs for other people? Carl Knight: I started singing and working clubs when I was in my 20's. Bronson: When you write a song do you write with a guitar, with a piano? Carl Knight: I write with a guitar. I write mostly with hooks, things I hear people say or something I pick up off a billboard. Sometimes when it hits me just right I can write a song in 30 minutes. Of course then I critique it and take days going over it and renewing the lines and checking the song. Bronson: Have you done much cowriting? Carl Knight: Very little cowriting. I don't cowrite much, I generally write by myself most of the time. I can cowrite, I've written 2 or 3 songs with other people but I find that most of my real good ideas come in the middle of the night. I'll be laying in bed and just something will hit me and I'll get up and maybe write 2 or 3 hours at night, the wee hours of the morning. I've written some of the best songs I've ever written in the dead hours of the morning. Or if I'm on a long trip and driving. I have a recorder and I just lay it in the seat and sometimes I get some great ideas just driving by myself. Bronson: How long did you work with Chet Atkins? Carl Knight: Chet opened so many doors for me in Nashville. He would have Carolyn, his secretary at that time, she would call and make an appointment for me to take some material and who's going to turn down Chet Atkins? I was able to get in all the doors. The first year I was here I was so very lucky. I had 13 songs cut the first year I was here. Bronson: Has all the changes in the music business affected how you pitch your songs? Carl Knight: It's harder to pitch songs now then it was when I first came up here in the late 60's. You could pretty much walk into an office and talk to the receptionist and if you didn't get to see anyone you could leave something, but that's changed. It's pretty hard to get to these artists now, it really is. Bronson: You recently won a pretty important award? 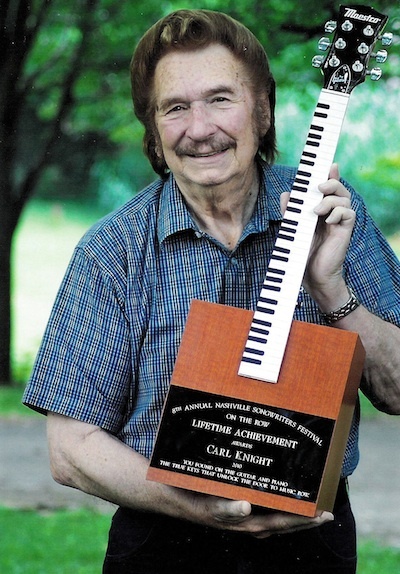 Carl Knight: Yes, I was presented the Lifetime Achievement Award by the Nashville Songwriters Festival in June 2010. Right after that, what I was so proud of is my home state of Mississippi inducted me into the Mississippi Hall of Fame. The museum is in my hometown of Jackson. Bronson: You mentioned the Discovery Channel? Carl Knight: Yes, the Discovery Channel called me from New York and came down and did a story on me. They brought 13 camera men and light men and 5 vehicles and filmed for 5 1/2 hours. Kind of did a life story on me and it'll be out in March or April. That was pretty thrilling to have that happen and it only took 81 years (laughing).